My Pressure Cooker Chicken Enchiladas are an easy dump and go recipe. Made with basic pantry stables and some frozen chicken. These Pressure Cooker Chicken Enchiladas are perfect for those days that you didn’t plan dinner because you are too busy or rushed. 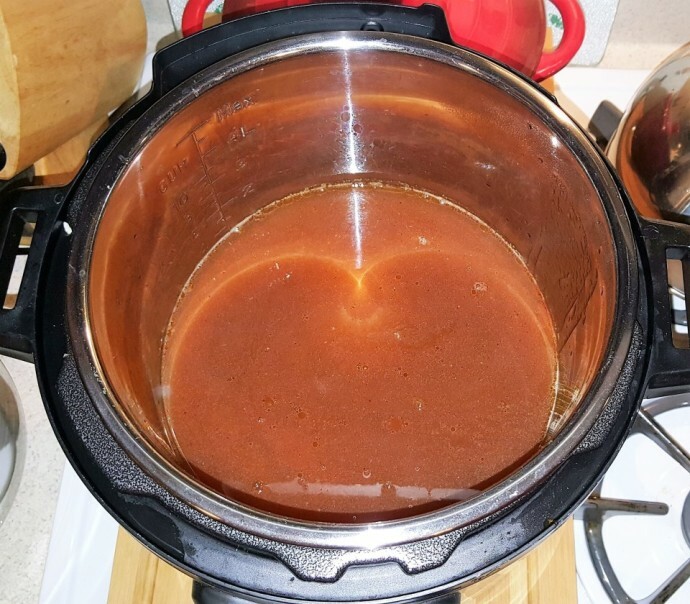 It’s a super easy dish to make in your Instant Pot or Pressure Cooker. This recipe is adapted from Wolfgang Puck and Deb Murray. 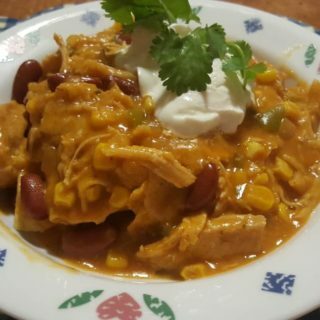 Can I use Frozen Chicken for Pressure Cooker Chicken Enchiladas? This is the beauty of this recipe. Frozen chicken will work in this recipe, so there is not much planning. You can use fresh or thawed chicken, as well, which actually is even better. 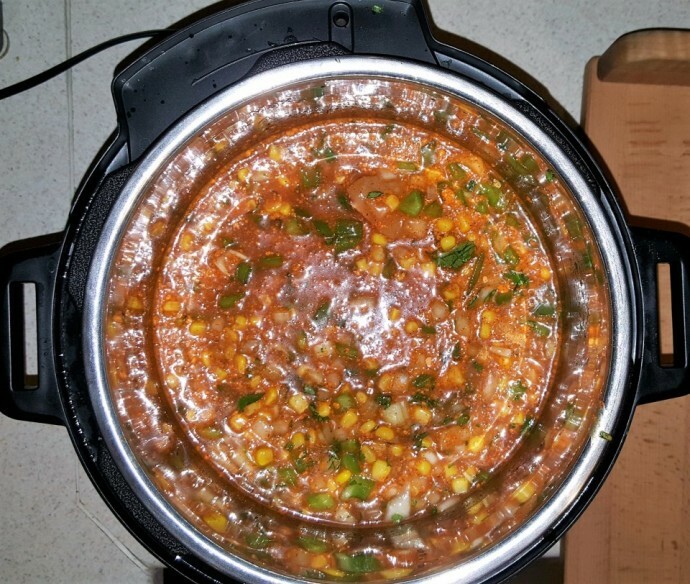 Enchilada sauce, frozen corn and other ingredients are usually in our pantries, so no need to plan dinner! 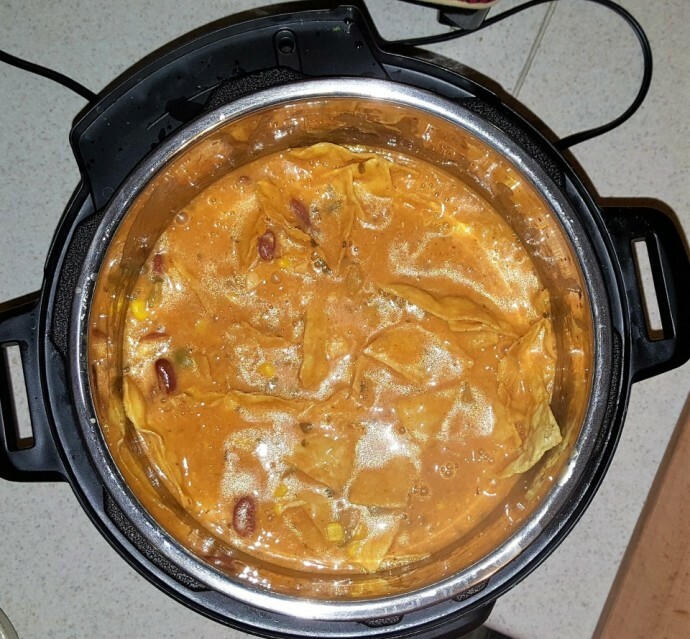 What are the Ingredients for Pressure Cooker Chicken Enchiladas? Feel free to make your own Kidney Beans, if you don’t want to use canned beans. What can I Serve with Chicken Enchiladas? 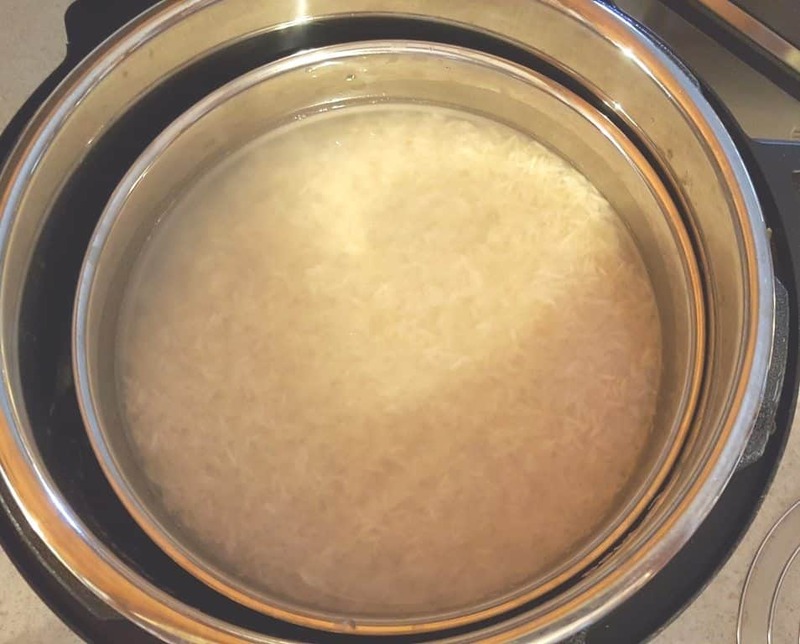 How about rice, using my Pressure Cooker Perfectly Cooked Pot In Pot Rice? 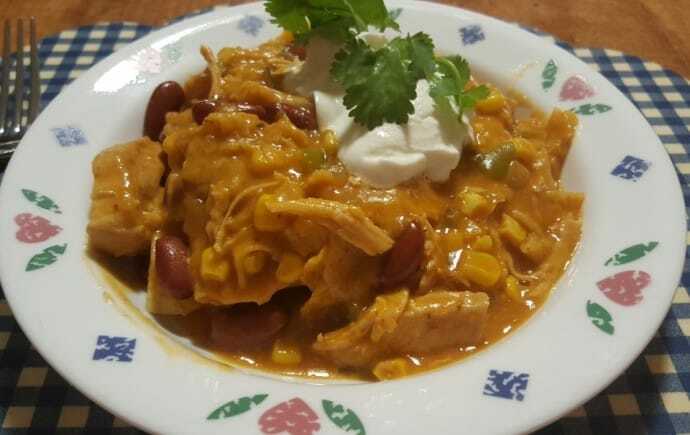 Turn this Pressure Cooker Chicken Enchiladas recipe into a one pot meal! You will just need two accessories..
A pressure cooker insert pan. Chicken Broth and Enchilada Sauce! Can I use Frozen Chicken Broth or Chicken Stock? 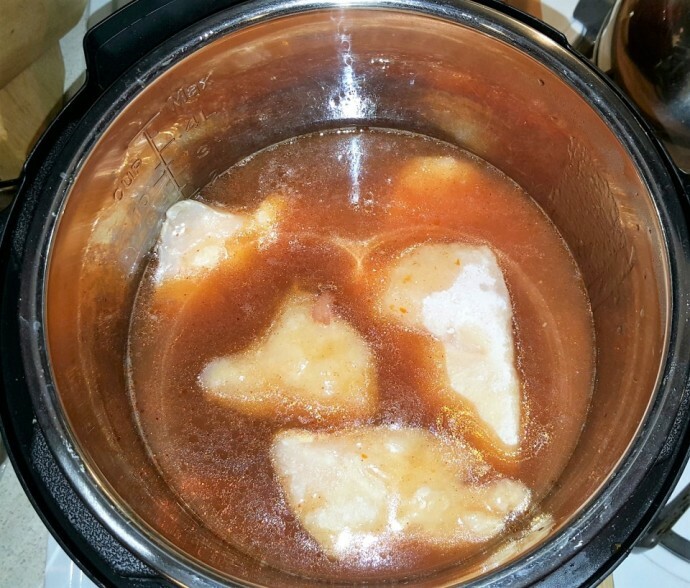 If you are short on time and don’t have fresh Homemade Chicken Stock/Broth, no worries. Assuming you have a container of frozen Chicken Broth, just use the Instant Pot or Pressure Cooker on sauté and defrost the broth. Then continue on with the recipe. Another option is to mix up some broth. I always have a jar of Better than Bouillon Chicken Base in the fridge. 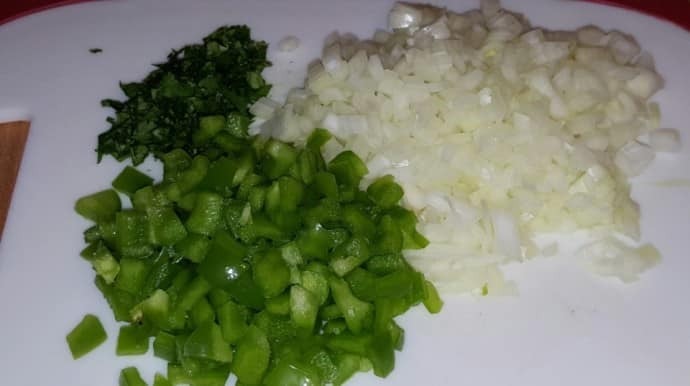 Dice up the green pepper and onions. Almost everything gets tossed in at once! 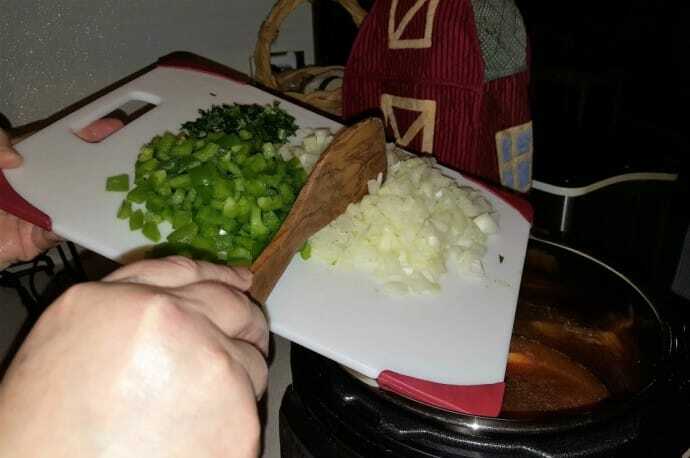 In goes the peppers and onions. My favorite spatula is the Cilio Olivewood Spatula. Add in all the seasoning and mix it into the liquid. You don’t need to mix it well, just get it combined, so it is not sitting dry on the top. 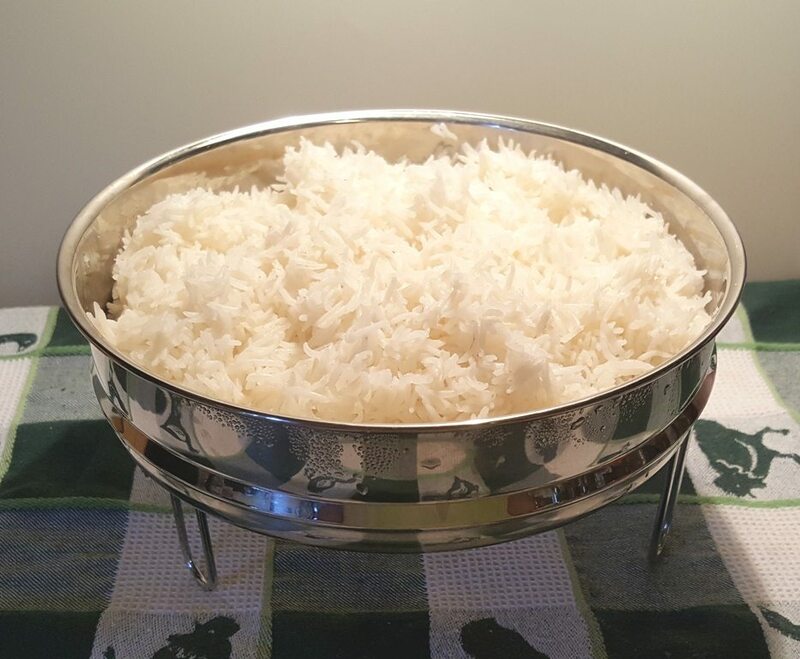 Close the lid and you are ready to push that button, unless you are making the Pressure Cooker Perfectly Cooked Pot In Pot Rice. If making this a One Pot Meal using my Pressure Cooker Perfectly Cooked Pot In Pot Rice recipe, add your Tall Legged Trivet and rice now. Slicing the chicken is optional. I like chicken in each bite, while others prefer to have large chunks. After all the pressure has been released, remove the chicken with Stainless-Steel Tongs from the Instant Pot or Pressure Cooker. Chop it up however you like; in strips, shredded, chunks. Then return the chicken back into the pot. What Kind of Cheese is Used for Chicken Enchiladas? Cheddar, Monterey Jack, Oaxaca, and Asiago are all good choices. 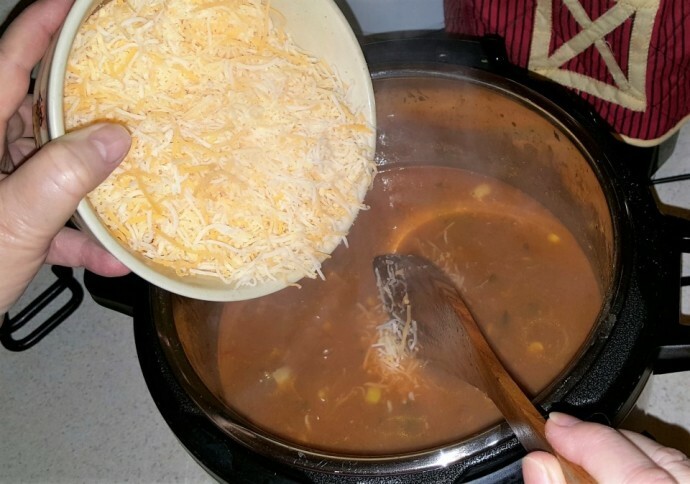 Make sure you have all your cheese shredded in advance, if you are using blocks of cheese. You can always just buy a bag of pre-shredded Mexican-blend cheese and mix in, until melted. The chicken cooks so quickly. The corn tortilla chips will absorb the liquid and become soft, like enchiladas. It’s so yummy! 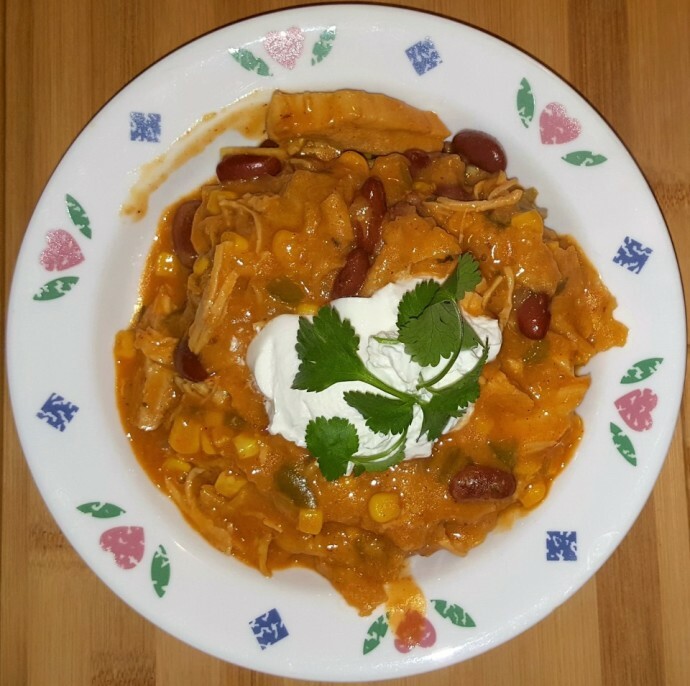 Top with sour cream, or with your own homemade Instant Pot Greek Yogurt, and a garnish of cilantro and enjoy! How do I store Leftover Chicken Enchiladas? The chicken enchiladas freeze well and are so simple to heat up in a Instant Pot or Pressure Cooker. We like to store the leftovers in 24 ounce Reditainers Extreme Freezer Containers as they are BPA-free. They hold up well and are perfect for two servings each. Other Quick and Easy “Dump” Recipes. 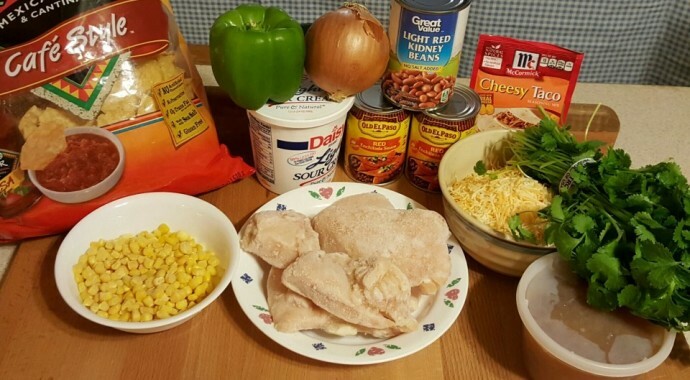 Add everything, but the last four ingredients to Pressure Cooker cooking pot. Cook at High Pressure for 6 minutes. When Beep sounds, allow a 10 minute natural release. 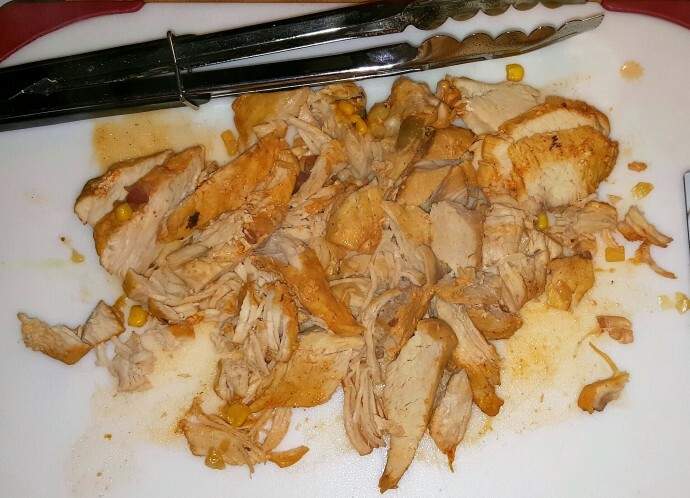 Remove the chicken and slice or shred and place back into Pressure Cooker cooking pot. Select the Sauté or Browning function, add cheese and tortillas and stir until cheese melts. Serve with a dollop of sour cream and scallions on top. Canned green chiles are optional for a spicier dish. For a little less spice, use mild enchilada sauce or ½ mild and ½ medium. If your chicken is not frozen, increase stock by 1/8 cup. If desired, before adding cheese and tortillas, remove cooked chicken, lightly fork shred and put back in pot. PIN this Pressure Cooker Chicken Enchiladas! My boys loved this…in the “keeper/make again” pile! We used 4 oz of medium green chilies and it was GREAT, and subbed black beans for the red (because that’s what we had) and it was great! 6 fill-your-belly servings. Avocado slices for garnish! I am so glad you like this recipe. Thanks for letting me know. 🙂 Avocado is great on this enchiladas. My 14 year old and I made this tonight. The taste was fantastic the whole family loved it. This is absolutely delish! It’s on the regular rotation in our house. This was delicious! I made this for dinner and my husband instantly agreed, “It’s a keeper!” Thank you for sharing a simple, easy, TASTY dish! I followed the ingredient list with the exception of no green chiles or red pepper flakes, only because we didn’t have them. My chicken breasts probably should’ve been cut in half because they weren’t quite done in the specified cook time. Just a few extra mins and it was totally worth the wait! I can’t find Cheesy Taco Mix packets at the store, is there an alternative?